Seems to me that this little guy should have been left in the nest. What is this? I've never seen anything like it! OK. Natural history lesson coming up. 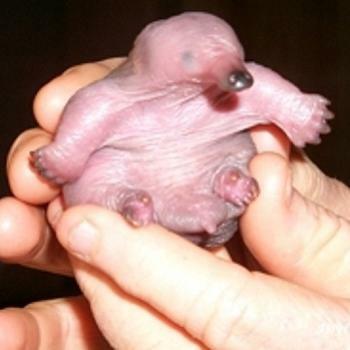 Echidnas are one of two monotremes, the other being the platypus. They lay eggs and provide milk for their young. The babies are helpless and, as neither species has a pouch, must stay in their den for several months(probably until their spines develop, or fur in the case of platypus.